It is important for the District to have access to all meters for data collection and maintenance. Clear access to the box helps to ensure that it can be quickly turned off in an emergency. 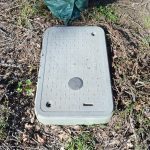 It is the property owner/tenant’s responsibility to maintain clear access around the meter box. 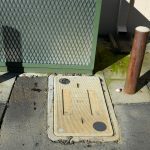 If the meter is obstructed or inaccessible, the District will notify the property owner/tenant to either remove the obstruction or clear the area surrounding the meter. See below for examples of accessible meters. Trim bushes, trees, and grass surrounding the meter. 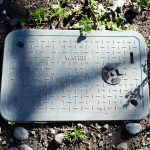 During the growing season, plants can cover a meter box very quickly. Keep pets away from the path that leads to the meter. If you have a guard dog for security, please let the District know so that meter readers are aware. Please make sure that no objects cover or block access to the meter box. Items that have been found blocking meters include cars, trailers, construction materials, fences, landscape bark, gravel, and plants. If the meter is located behind a gate that is normally kept locked, the District will contact you to arrange access to the meter. If you have any questions regarding meter accessibility please call the District at (916) 483-2452 or email at mail@carmichaelwd.org.